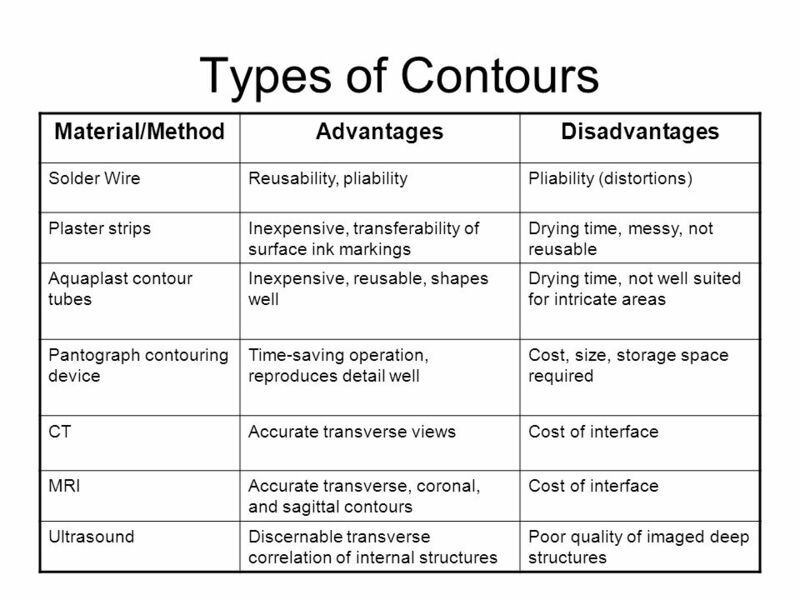 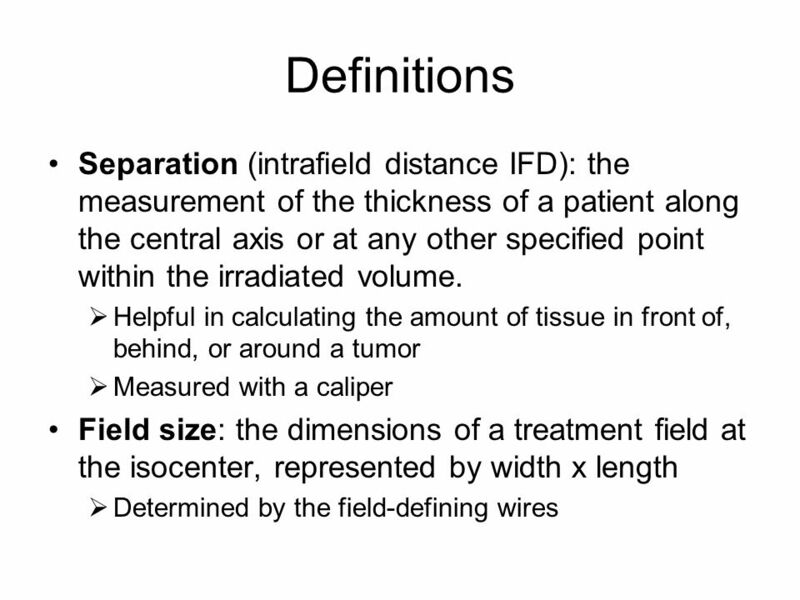 3 Definitions Localization: geometrical definition of the position and extent of the tumor or anatomic structures by reference of surface marks that can be used for treatment setup purposes. 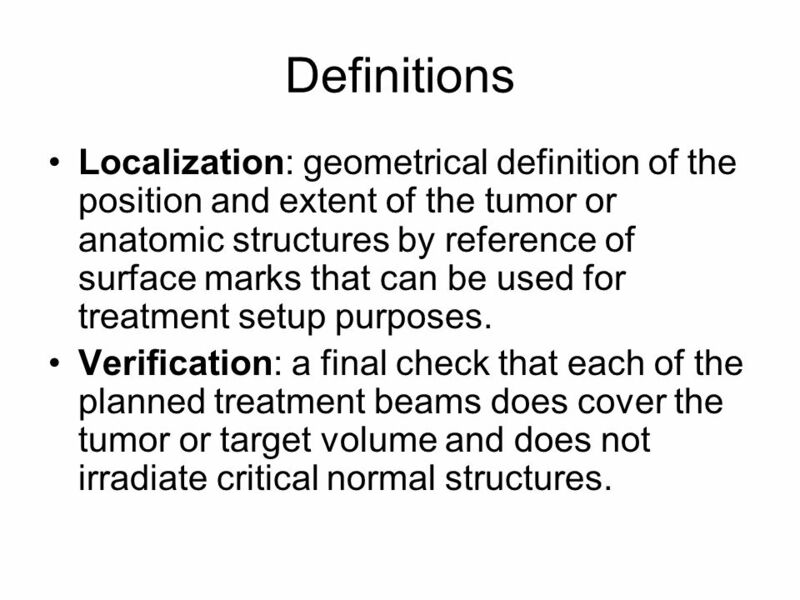 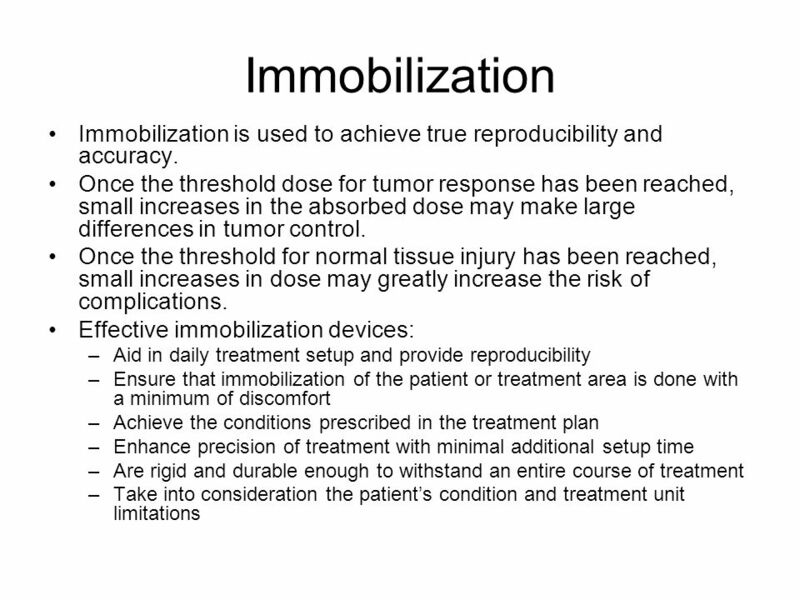 Verification: a final check that each of the planned treatment beams does cover the tumor or target volume and does not irradiate critical normal structures. 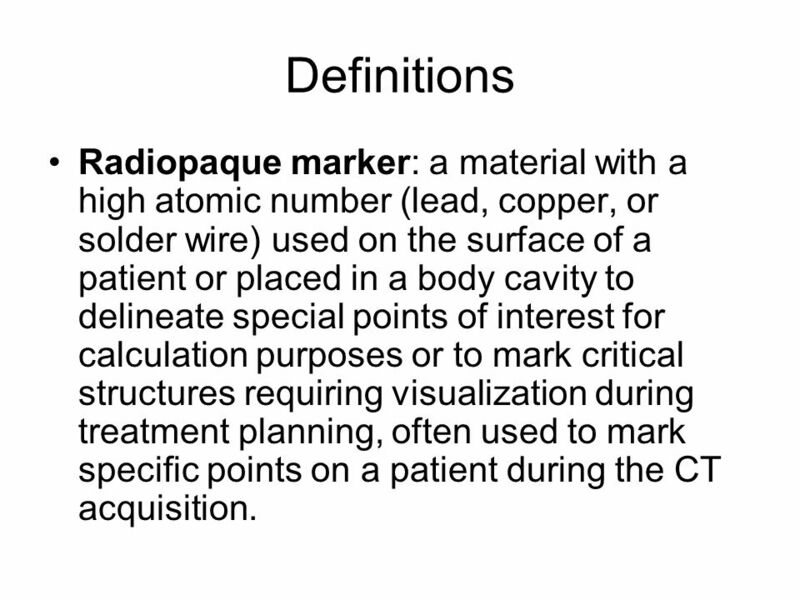 4 Definitions Radiopaque marker: a material with a high atomic number (lead, copper, or solder wire) used on the surface of a patient or placed in a body cavity to delineate special points of interest for calculation purposes or to mark critical structures requiring visualization during treatment planning, often used to mark specific points on a patient during the CT acquisition. 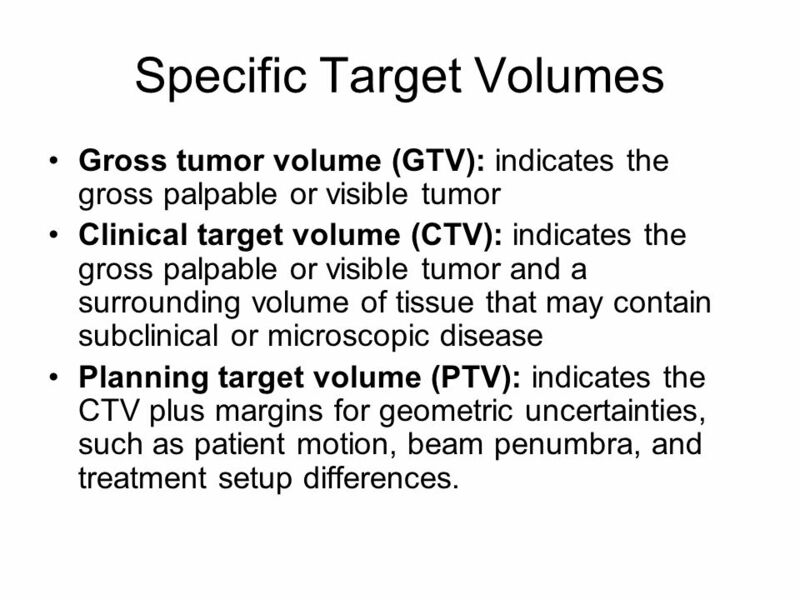 Gross tumor volume (GTV): indicates the gross palpable or visible tumor Clinical target volume (CTV): indicates the gross palpable or visible tumor and a surrounding volume of tissue that may contain subclinical or microscopic disease Planning target volume (PTV): indicates the CTV plus margins for geometric uncertainties, such as patient motion, beam penumbra, and treatment setup differences. 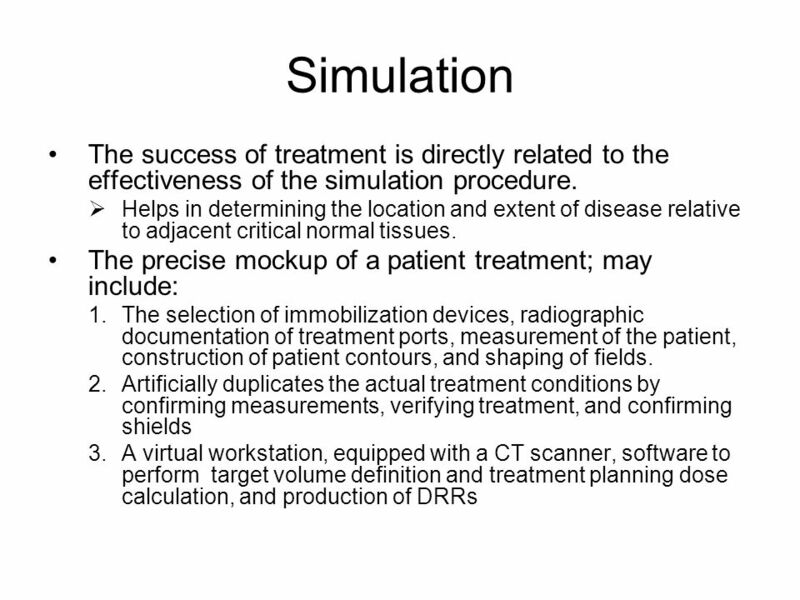 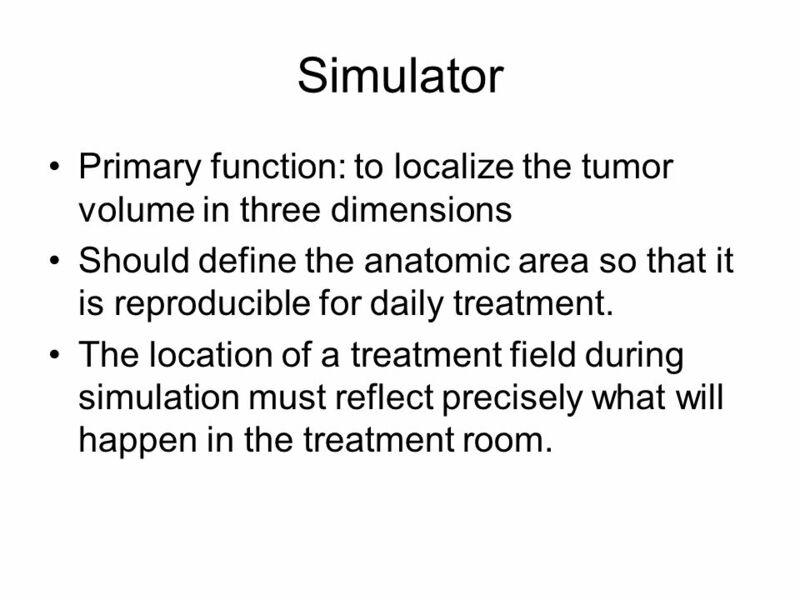 7 Simulator Primary function: to localize the tumor volume in three dimensions Should define the anatomic area so that it is reproducible for daily treatment. 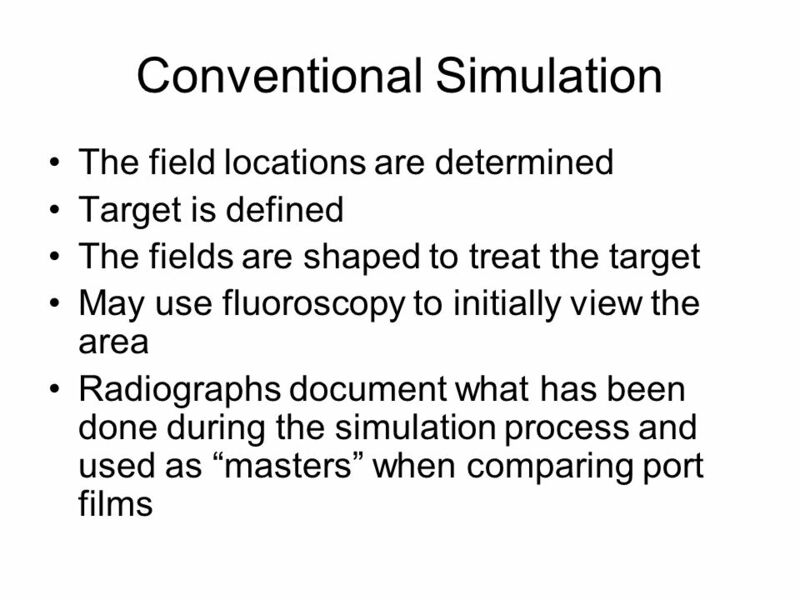 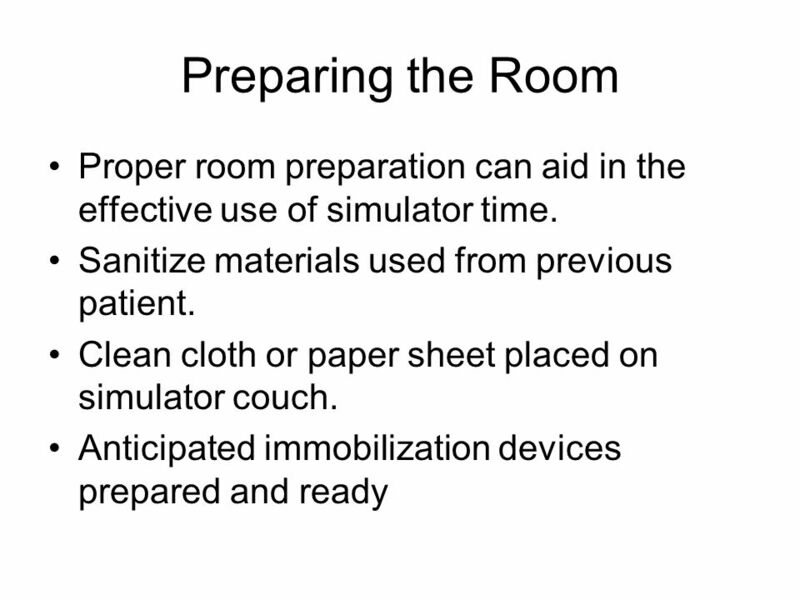 The location of a treatment field during simulation must reflect precisely what will happen in the treatment room. 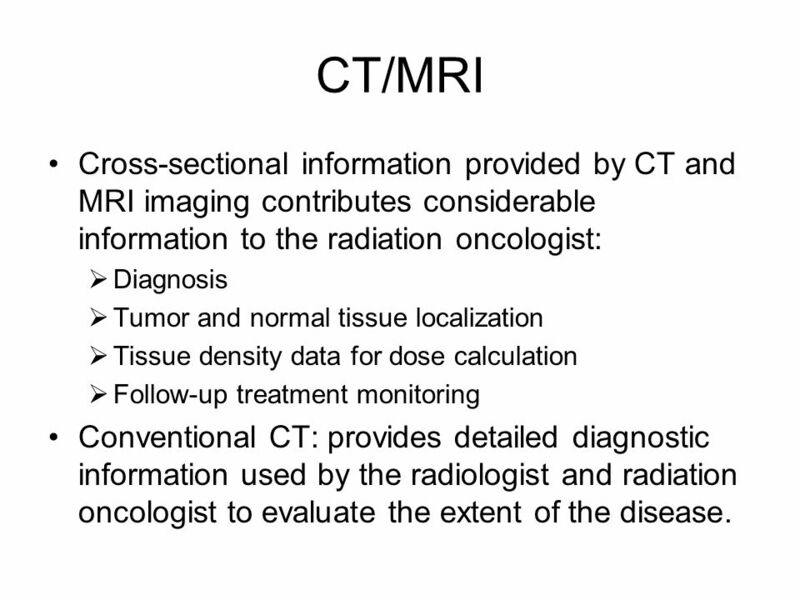 8 CT/MRI Cross-sectional information provided by CT and MRI imaging contributes considerable information to the radiation oncologist: Diagnosis Tumor and normal tissue localization Tissue density data for dose calculation Follow-up treatment monitoring Conventional CT: provides detailed diagnostic information used by the radiologist and radiation oncologist to evaluate the extent of the disease. 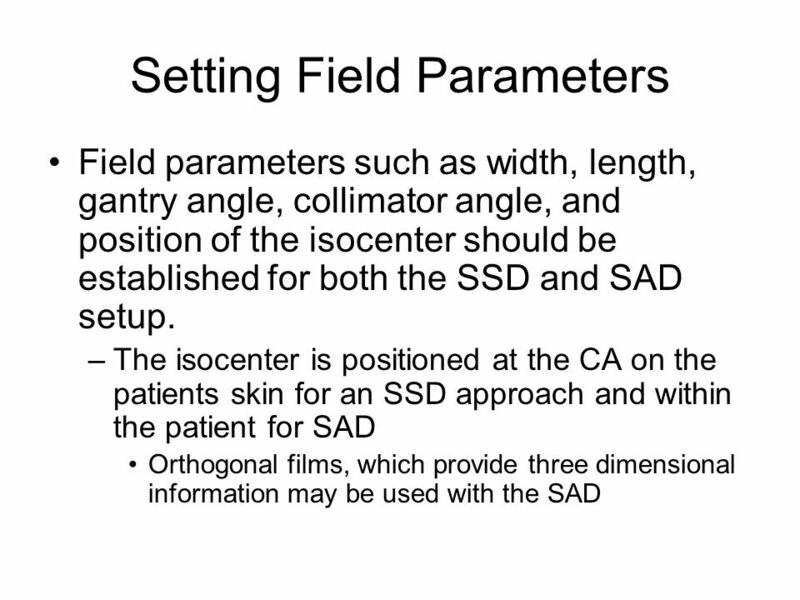 SSD: positions a fixed treatment distance of 80 or 100 cm on the patient’s skin for each field. 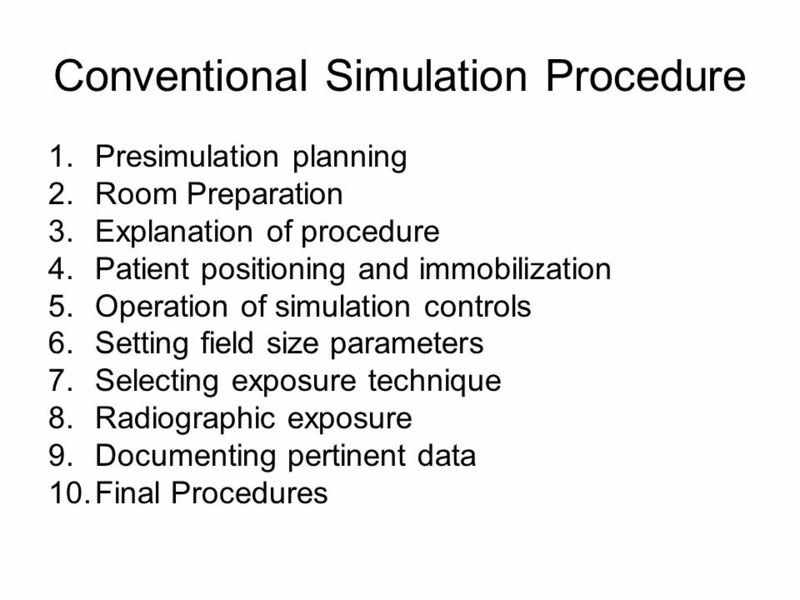 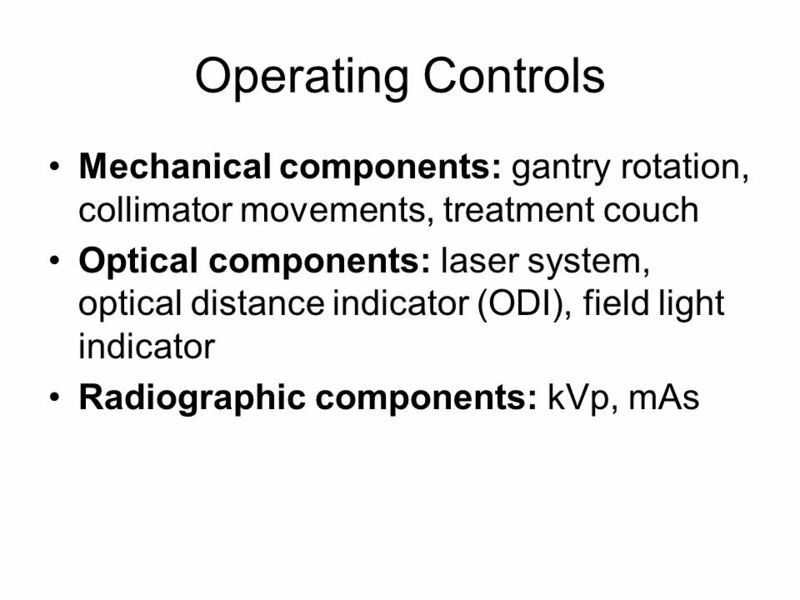 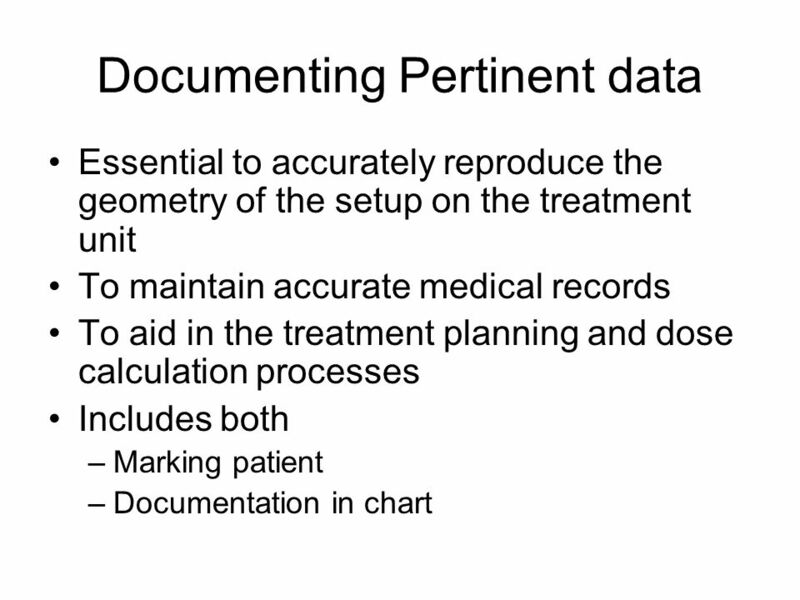 Requires repositioning the patient for each field before treatment. 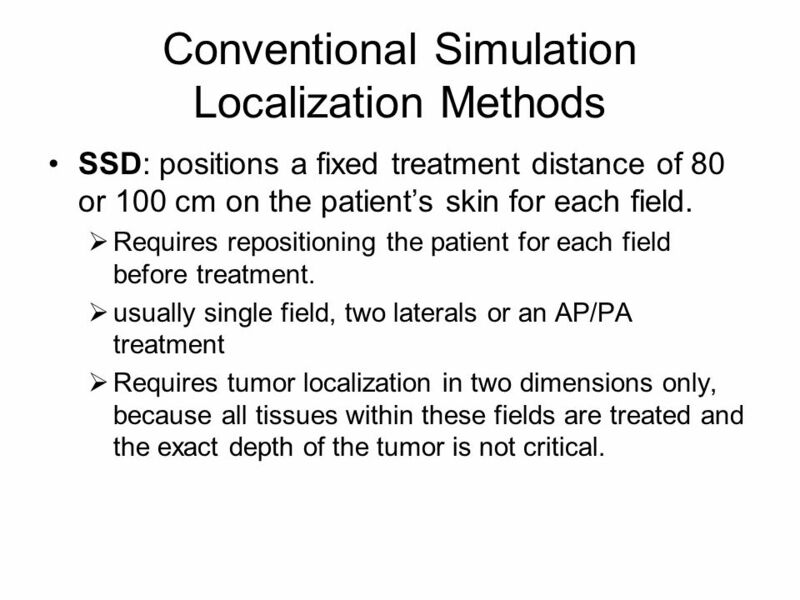 usually single field, two laterals or an AP/PA treatment Requires tumor localization in two dimensions only, because all tissues within these fields are treated and the exact depth of the tumor is not critical. 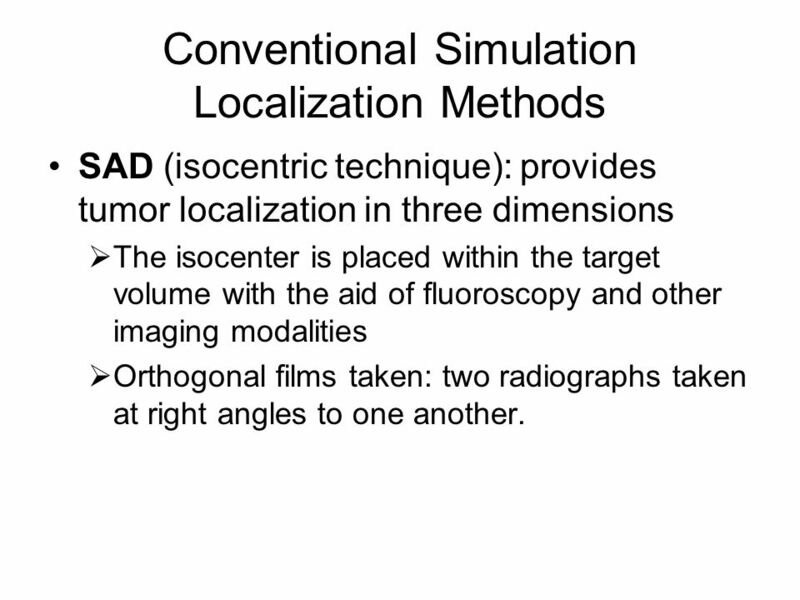 SAD (isocentric technique): provides tumor localization in three dimensions The isocenter is placed within the target volume with the aid of fluoroscopy and other imaging modalities Orthogonal films taken: two radiographs taken at right angles to one another. 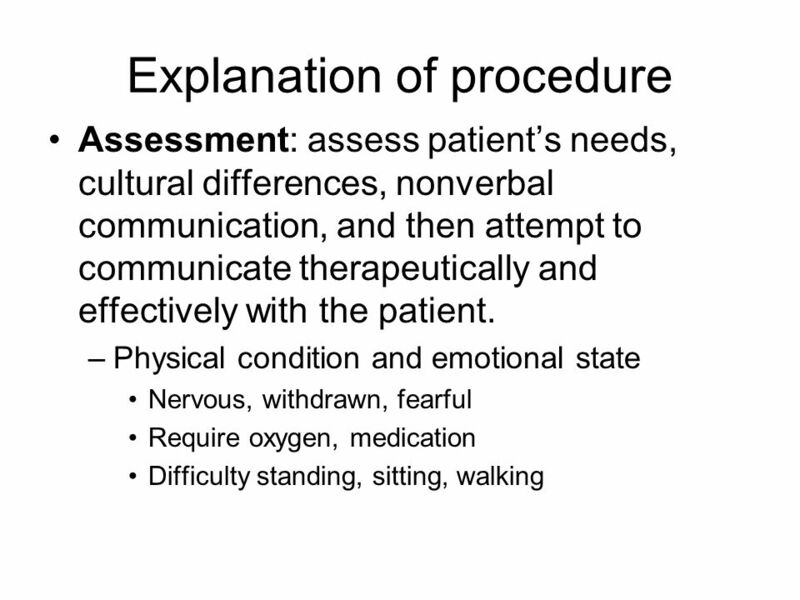 An assessment of all relevant patient information and an evaluation of possible treatment approached before the patient arrives. 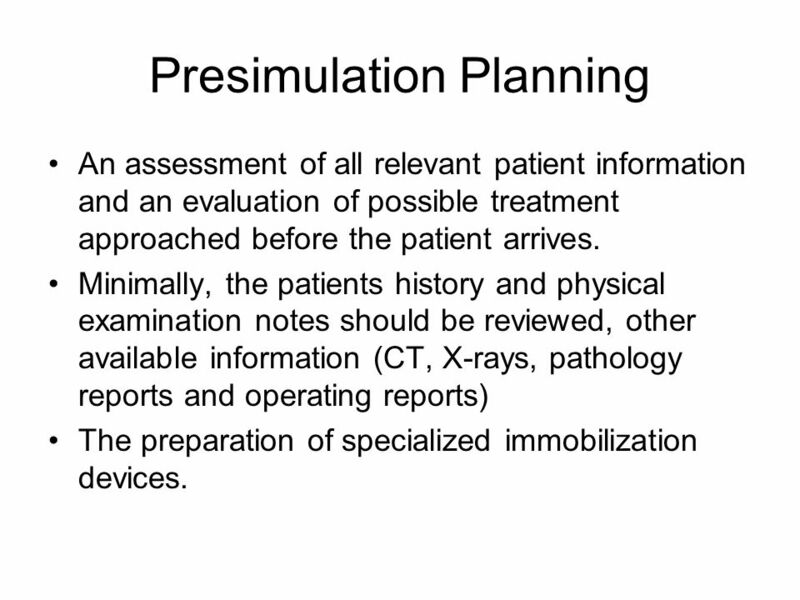 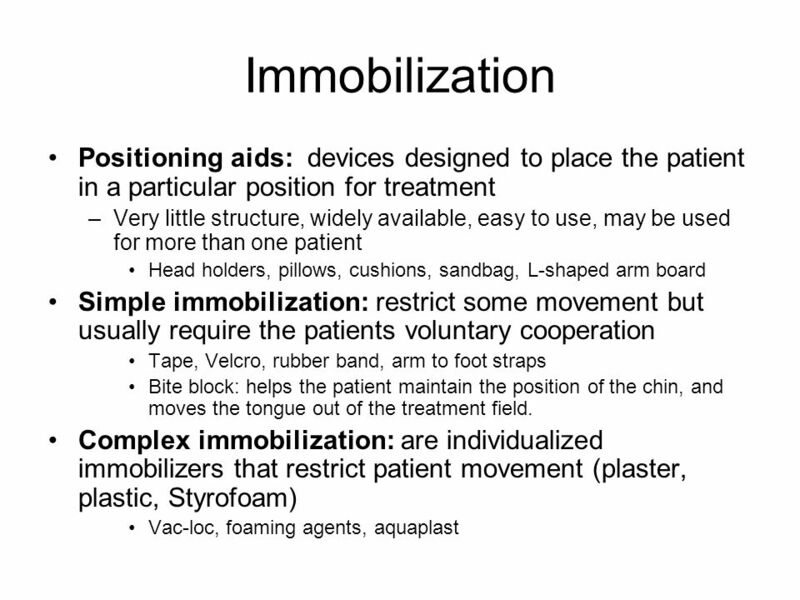 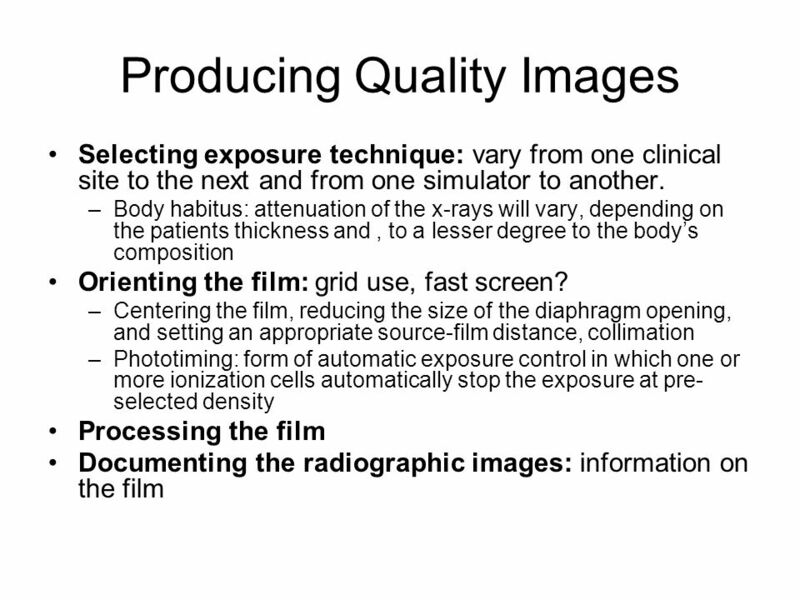 Minimally, the patients history and physical examination notes should be reviewed, other available information (CT, X-rays, pathology reports and operating reports) The preparation of specialized immobilization devices. 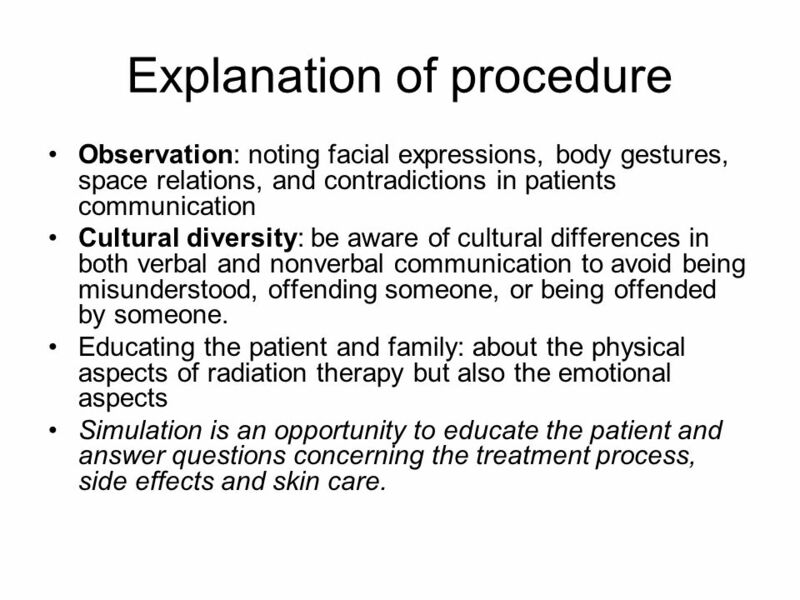 Observation: noting facial expressions, body gestures, space relations, and contradictions in patients communication Cultural diversity: be aware of cultural differences in both verbal and nonverbal communication to avoid being misunderstood, offending someone, or being offended by someone. 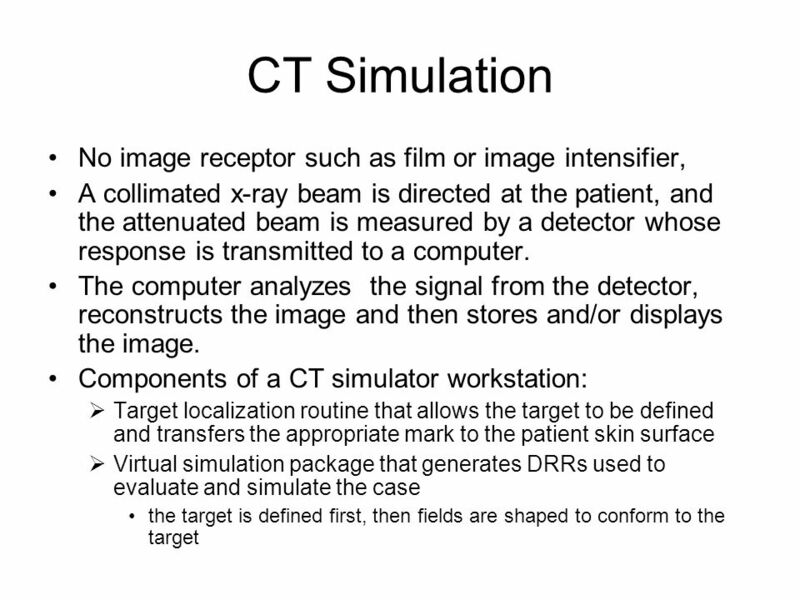 Educating the patient and family: about the physical aspects of radiation therapy but also the emotional aspects Simulation is an opportunity to educate the patient and answer questions concerning the treatment process, side effects and skin care. 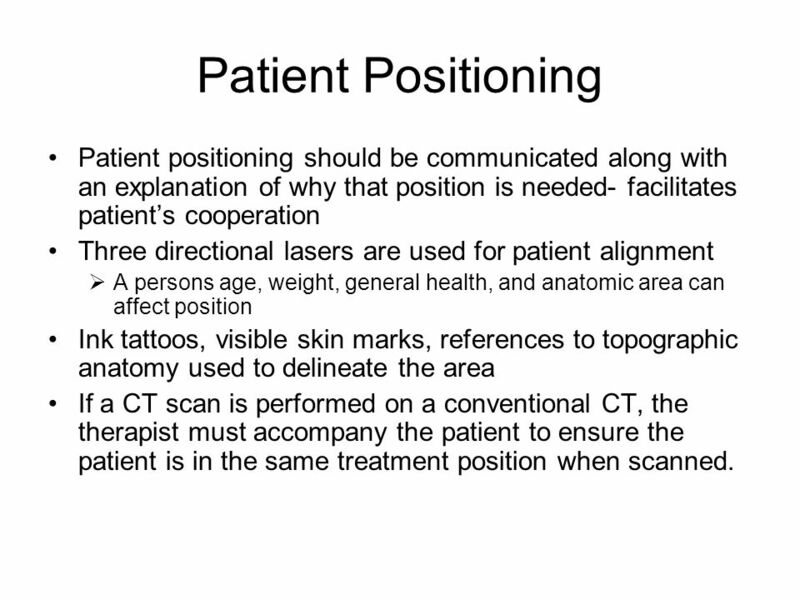 20 Patient Positioning Patient positioning should be communicated along with an explanation of why that position is needed- facilitates patient’s cooperation Three directional lasers are used for patient alignment A persons age, weight, general health, and anatomic area can affect position Ink tattoos, visible skin marks, references to topographic anatomy used to delineate the area If a CT scan is performed on a conventional CT, the therapist must accompany the patient to ensure the patient is in the same treatment position when scanned. 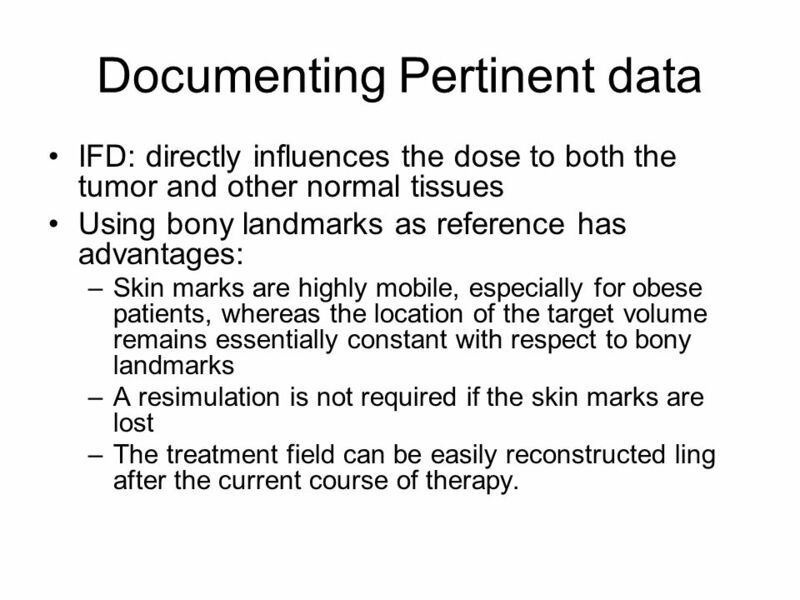 IFD: directly influences the dose to both the tumor and other normal tissues Using bony landmarks as reference has advantages: Skin marks are highly mobile, especially for obese patients, whereas the location of the target volume remains essentially constant with respect to bony landmarks A resimulation is not required if the skin marks are lost The treatment field can be easily reconstructed ling after the current course of therapy. 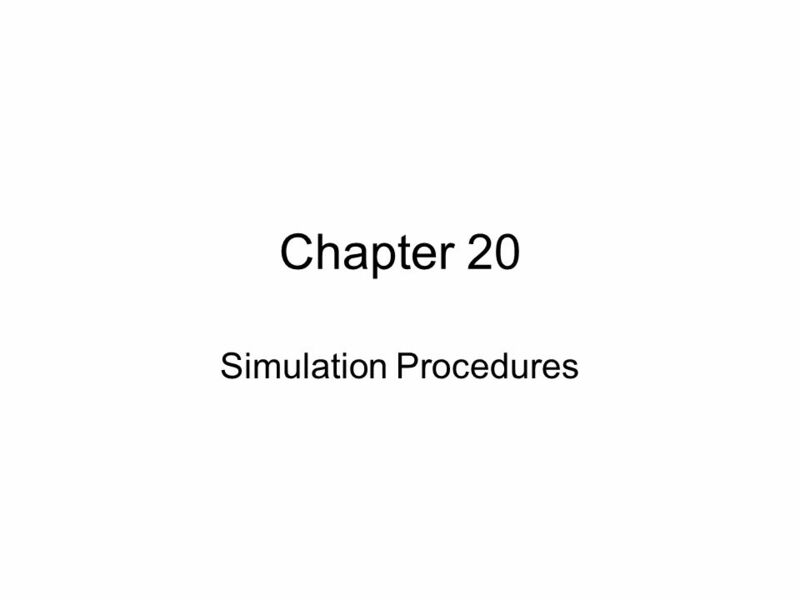 بسم الله الرحمن الرحيم ﴿و قل رب زدنى علماً﴾ صدق الله العظيم. 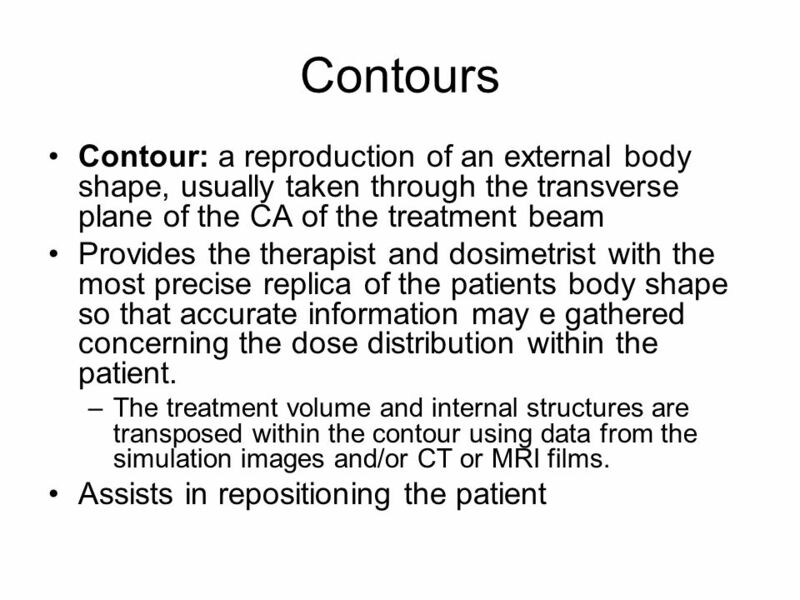 Lecture (4). 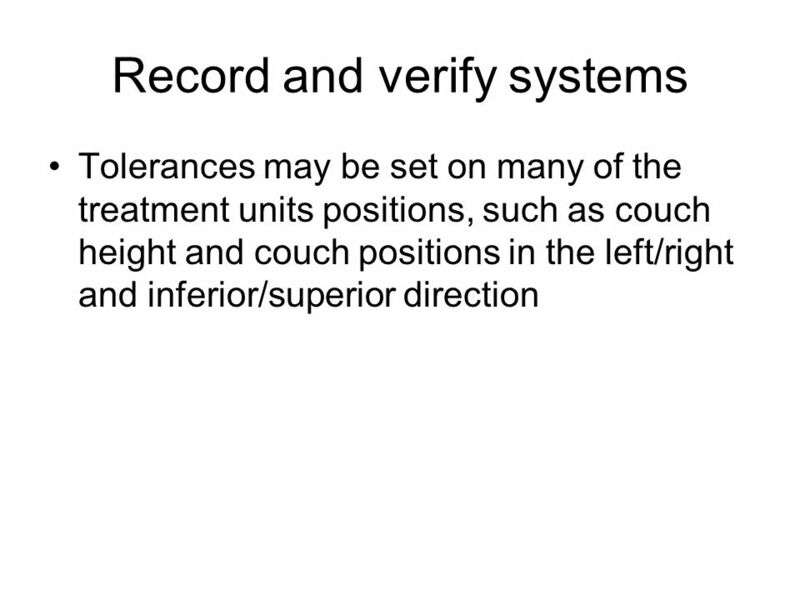 Step by Step Guide to a Typical Radiographic Examination Request Form Check form is fully completed and signed. 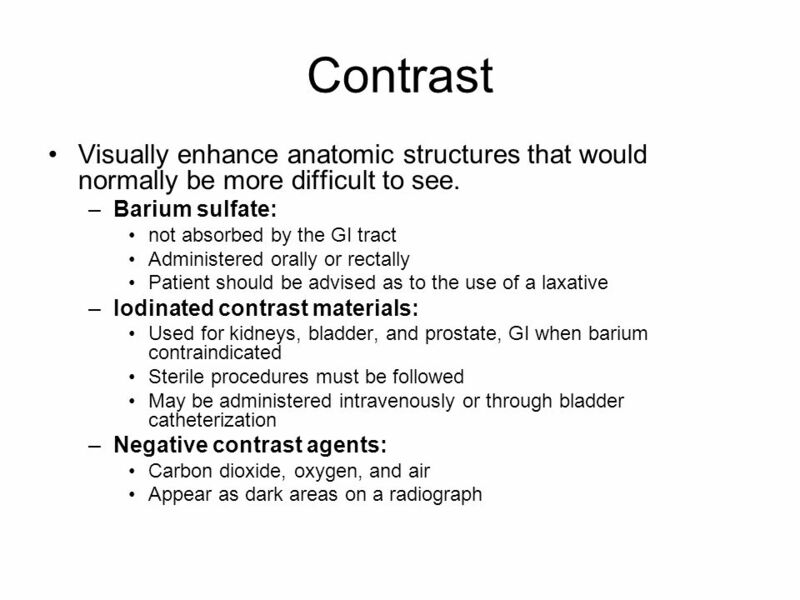 Check pregnancy question. 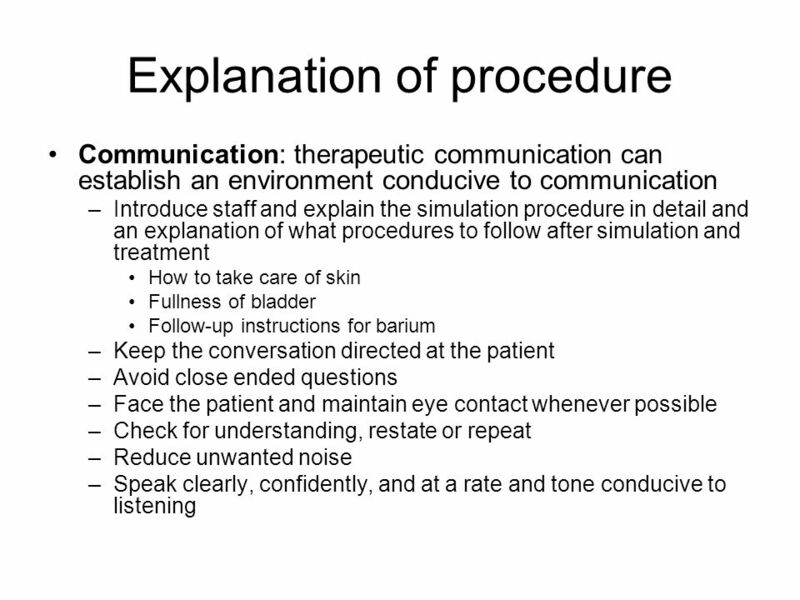 © 2011 National Safety Council 4-1 COMMUNICATION LESSON 4.